His Storm Ended On January 14th. Read About It Here. The Storm Education Team is a personally funded, North Carolina non-profit, public education project that. For the past eight years we've supplied story opps, data, video and field reports for local, national & worldwide TV, radio, newspapers and the web. Find out more about us here. To contact us for story opportunities OR to use us a field resource, send email here. To learn more about specific weather threats, choose a topic under "Weather Dangers" at the top of this page. For preparedness information for all types of natural (and manmade) disasters check out our Severe Weather Education & Prep Info Here. A great partner of the Plan. Prepare. Protect. initiative, the American Red Cross has a vast collection of preparedness resources on their site. Their new program site, is a must visit for every family. Severe Weather Awareness Week - For Year-round Safety. Severe thunderstorms can bring high winds, damaging hail, flooding rains and can spawn tornadoes and like ALL thunderstorms, dangerous lightning. Learn about preparedness including putting together your family plan, emergency supplies and more here. You can also download our Severe Weather Safety Card. It's general weather safety info good for the entire year, but pay special attention to the 'water over the road' part during hurricane season and after flooding thunderstorms. Severe Weather Awareness Weeks are being observed across the counrty as Spring arrives. See the schedule for your state here. Severe Weather Threats Aren't Limited to Spring. Learn more here! Flood Safety Week Is Very Important. Hurricane Season Lasts Through November 30th. June 1 - November 30th is the official season, but that's based on statistical averages - storms can actually happen just about any time of the year, but are very rare in winter and spring. NOAA Weather Radios Save Lives - They're 'Smoke Detectors' For Severe Weather. 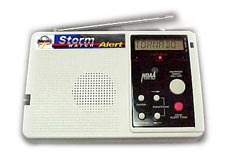 If you don't have one yet, get a NOAA weather alert radio. This radio will alert you to any severe weather watches & warnings and it's a great everyday source for the latest conditions and forecasts, recreational weather and the info for the beaches and mountains, too! Get the details and get a radio here. Thunderbolt Storm Detectors Give You An Edge When Storms Move In. Get the details and get your unit here. Pelco Chose Us For Their Article About Exciting Alternative Uses For Their Cameras. You can see the article about our work with their products here.